Portrait of a young woman in eyeglasses, vest over white short-sleeved blouse, and leaf-patterned skirt sitting to the side of barracks porch in Rohwer concentration camp, Rohwer, Arkansas, 1942-1945. She sits facing R as she smiles at viewer. 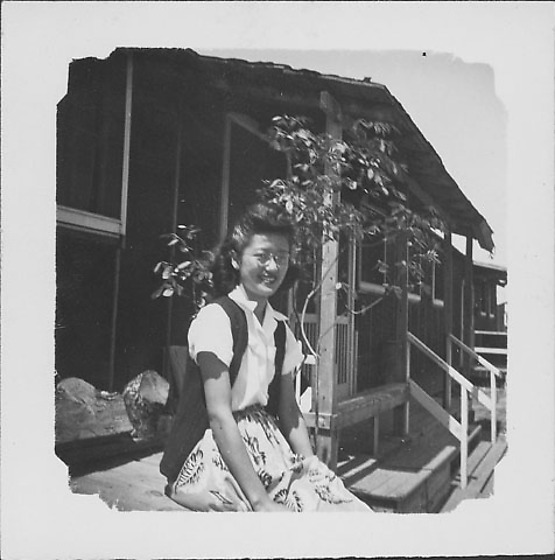 Chunks of firewood or cut logs behind her at L, small tree by porch railing at C. Barracks with white trim in background. Image has decorative geometric cropped corners at border. Woman also in 97.292.6M, 6R, 6AE.